Ron George: Perspective : Why is There No Indian in the Tour de France? Perspective : Why is There No Indian in the Tour de France? Such was a recent question on Quora. There’s little reason to pick the Tour de France if you want to inspect the absence of Indians in international professional cycling. It’s what goes on at a more fundamental level of international racing that counts. At the 2017 Asian Road Racing Championships held in Bahrain, India did seem to have “decent” amount of pedal power in terms of two national time trial winners representing at the ITT and a total of six talented roadies at the TTT. Even though numbers weren’t on their side, certainly it was commendable that these six got an invitation to represent the country. However, it panned out that the Kazakhs, South Koreans and Japanese would go on to cream the competition. The best placed Indian at the ITT was a distant 5th place from last in a total field of 18. For a flat TT course, it is instructive to look at absolute power outputs as they tend to be an objective marker of sustainable intensity. 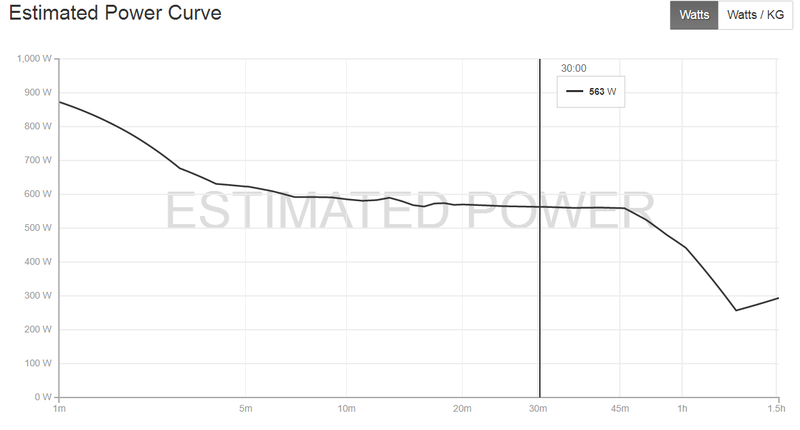 The following power duration chart is from a Kazakh rider, who was among the winners of the men’s TTT that week. You can see that 30 min power is pushing 500W. I’ll leave digging up the Indian power duration chart as an exercise for you. These Indian pros could better describe the intensity of racing at this level to you. 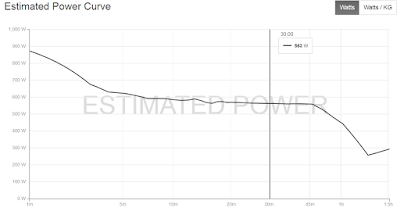 But personally, I see a gap of over 100 Watts for this duration between a Kazakh and an Indian, which is a,,,, little PACIFIC OCEAN to bridge in cycling parlance. Performance in any sport is multi-factorial. Sympathisers will tend to say that national poverty plays a big factor in setting back the sport. On the other hand, if national poverty were the only deciding factor, you shouldn’t even be seeing a war torn country like Iraq or even for that matter, Mongolia or Uzbekistan showing up to the races, let alone place well in contention for podium spot at these races. I’ll explore some other points that I think are important. 1) Physiological : As long as there is no raw talent, you will always be trying to fit a square peg in a round hole. At a fundamental level, performance in cycling is determined by a high VO2max and the maximum velocity and/or power output you can sustain AT steady state lactate level in your bloodstream. You take two cyclists - A and B. If B has a higher VO2 engine and can process work at a higher fraction of that for a longer period of time without fatigue, B is atleast on paper the faster cyclist at the end of the day. Unfortunately, sports science research and papers in Indian cycling are lacking in the public domain so we can’t make comparisons of national level Indian cyclists against similar international competitors. I do suspect there is a big gap in prime physiological indicators that define success in cycling. 2) Winning : One of ways to get into the TdF is through wild card teams. To be noticed for selection, you have to simply perform. You can have all the talent and train like a madman all year, but if you’re not winning and arguably by big margins, it’s going to be difficult. Essentially, the meat of a pro’s career is done and dusted by age 35 and the rest will be sobering to watch. It’s in the younger years that you can do some crazy things in life. For example, when ex US pro George Hincapie was still in his tender years, he was entering crits and lapping the entire field. Young Alberto Contador would show up at races with a heavy iron bike and still fry the field. The infamous Lance Armstrong competed in traithlons as a teenager and gave older experienced competitors a serious run for their money. Answering when can you see an Indian at the Tour de France is similar to how Africans entered the Tour de France in 2005, or for that matter, how Columbians entered the Tour de France in the 1980’s. Fundamentally, you need talent yes, but you need to win some BIG races on the cycling calender and you need the likes of Mr. Eddy Merckx and Mr. Bernard Hinault to notice you and bless your move forward. The Columbians had over 3 decades to mature as a cycling nation, today they have several top cyclists posted in the Tour de France. 3) Cultural : Cycling is a relatively new professional sport in India. In western countries, cycling talent is identified at a tender age and nurtured through the teens. People give a damn about it, they appreciate it. In India, families like to see their girls and boys get a good job, marry before 30 and get settled in life. Loitering the streets on a bicycle comes with a stigma. Furthermore, the collective culture of bike racing, when compared to other national pasttimes such as cricket, is dismal. On this point alone, we can write a big essay. On the other hand, one can argue that India is talented in sports like cricket, badminton, hockey and wrestling. TV air time and press coverage going to something India is good at, cannot be really argued against. There can be some balance, however. 4) Financial : There aren’t many bike races and professional development programs in the country. A few are springing up in parts of India, but nothing at the level to show normal average joe Indians that there is a professional future in cycling. If you can’t put food on the table and feed your family, I don’t care what it is - lorry driving, or gold merchandising, you won’t be doing it. In this respect, Indians are like any others from any other nation - they have their priorities. The sport does seem to be exploding in India which is a positive sign. Bike shops and cycling themed cafes are springing up. Several cycling clubs attract people to buy bicycles and take up recreational riding and racing. Another positive sign is a strong Indian presence in the management circles of the Asian Cycling Federation since Mr. Onkar Singh took office as it’s Secretary General. A third is, as I mentioned, the growth of junior cycling development programs which is identifying talent and taking them abroad to countries like Belgium. One example is the Indian Pro Cycling Project. 1) A fresh pool of genetically talented Indians into the sport, whether that is nationally or from overseas residing Indians. 2) Support for Indian cycling at the international platform. Such is happening currently at Asian level as I already mentioned. 3) Provides Indians an exposure to international racing and a glimpse of the true demands of a professional career. 4) Encourages businesses to notice cycling and support talents with sponsorships. 5) Encourages talented sports scientists to study indian cyclists and publish findings in international journals. What are the physiological gaps and what training methodologies can best bridge them? As a summation, I would argue that a string in essential supply chain needs to pop up to support the upward movement of Indian cycling professionals. Good bicycle manufacturers, mechanics, scientists, coaches, sport directors, sport management consultants, aerodynamicists, nutritionists, business people, sponsorships and importantly, partnerships with international facilities and people. The list goes on and on. In a challenging sport like cycling, you really have to sit on the shoulders of giants.